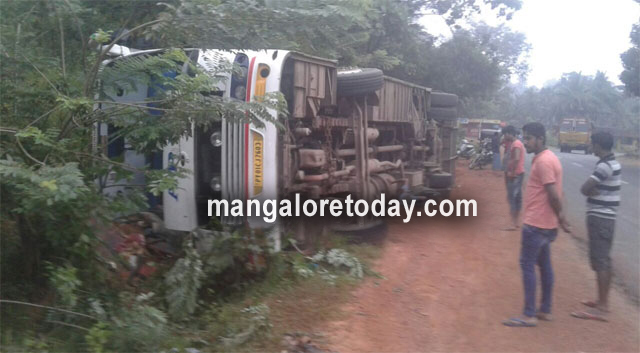 Bantwal, Oct 26, 2017 : Two persons were injured while others had a lucky escape when the private bus in which they were travelling overturned at Budoli near Mani on October 26, Thursday morning. The bus which had begun its journey from Bengaluru was proceeding towards Udupi via Mangaluru. The mishap occurred at around 5.30 am after the driver reportedly lost control over the vehicle near the Budoli curve. There were around 30 passengers in the bus who came out of the vehicle by breaking the rear glass. Vittal Police have visited the spot and have registered a case.